This entry was posted on Monday, July 6th, 2009 at 12:00 am and is filed under Comics. You can follow any responses to this entry through the RSS 2.0 feed. You can leave a response, or trackback from your own site. Very good. Love the art in this one! That is so beautiful! I love the different formats incorporated into this one. Good job! Thanks, George. I like experimenting, when time permits! <3 <3 and thrilled you’re sharing your experiments with us. This is really great! I have to admit I read all of your older comics just this evening and am really hooked. This is probably my favorite piece. Nice! That is some impressive work with the crayon style drawing, good job! that is just beautiful I am really impressed! Thanks, everyone! I appreciate all the positive comments. Maybe I’ll try some more crayonwork in the future I’ve also been interested in playing again with a brushpen. I’d be keen to hear how other folks prefer to work. Samantha, I know about your digital working habits from discussions on your site, Nate, your work is clearly ink and brush, and Speearr, I’m assuming by your comment that you’re a digital practitioner, too (Flash? Manga Studio?). Anyone else feel like sharing? Hi Chris, glad we were presented with your comics by Michael Kinyon. We love it. And as both I (Cathbad) and illustrator Mirlikovir just had a little baby, we’re all the more receptive to this last strip. This piece of artwork is so poetic. We love your inking, by the way. 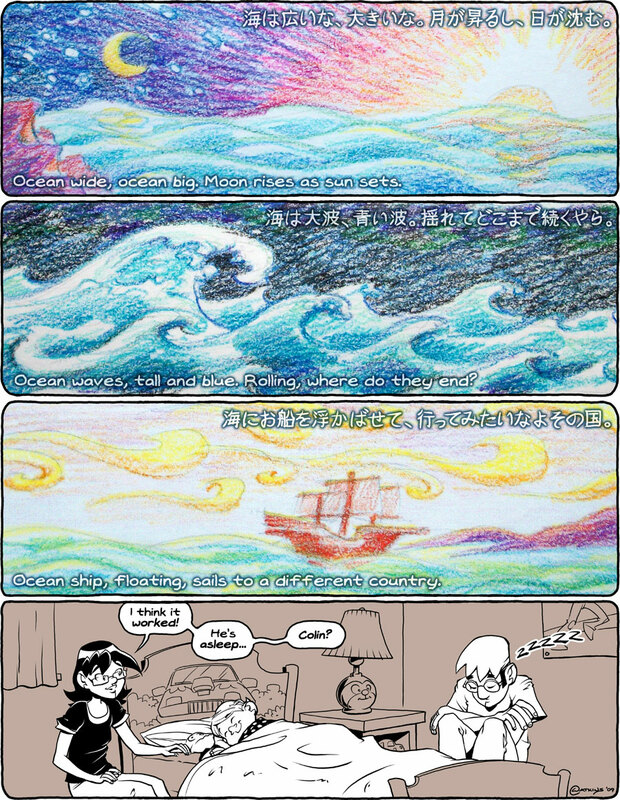 Reminds us of the mood of US graphic novels we enjoyed very much (Blankets is one). In one word, we’re hooked. See you soon, and we’ll follow you closely. Hi, Cath & Mirlik! Thanks for all the very kind words. Looking forward to digging into your comic, too. Congratulations on your little one! I made this my wallpaper Beautiful! Beautiful art on this one =) Great comic, am reading through the archives and loving it so far!